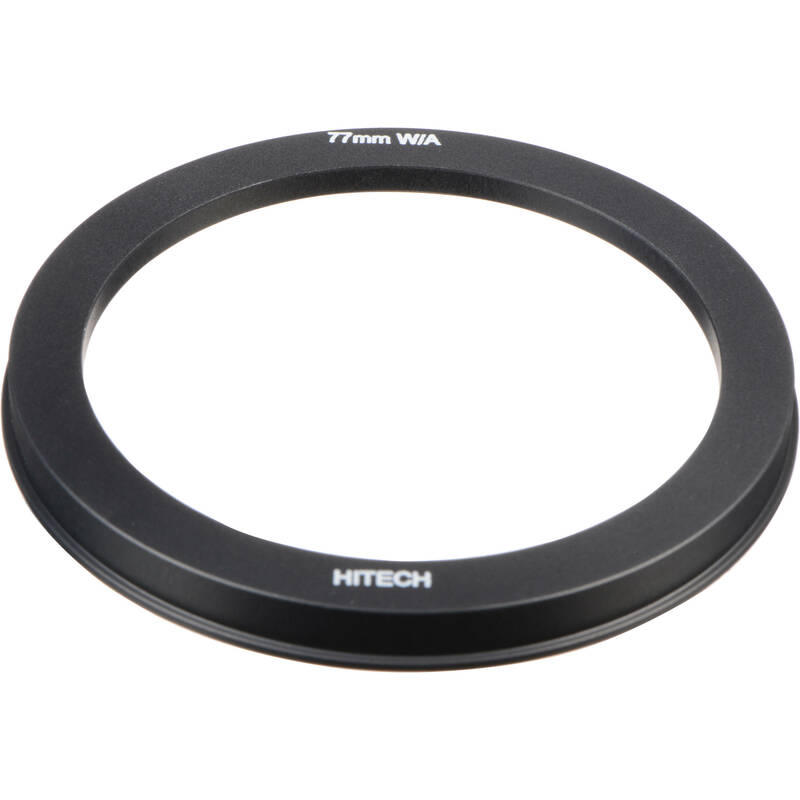 This 77mm Wide Angle Adapter Ring for 4 x 4" Filter Holder from Formatt Hitech is used to fit the filter holder and screw onto the desired lens, therefore getting the effect of the filter that was slid into the holder. The adapter ring places the holder millimeters closer to the lens not to cause any vignetting on the wide-angle lens. Hitech's rings are milled from aluminum in the United Kingdom. Box Dimensions (LxWxH) 4.1 x 4.0 x 0.7"
Wide Angle Adapter Rings for 4 x 4" Filter Holder (77mm) is rated 4.9 out of 5 by 9. Rated 5 out of 5 by Stephane from Great product, but may not fit your lens This is an adapter, and as others have mentioned it's essential for the filter holder. It's very well made out of black anodized aluminium. It may be easier to scratch the finish due to being matt, however the matt black will help reduce reflections back onto the filter.However be warned that this does not fit all wide angle lens! In my case, I've tried it on three lenses I had on hand and it fits the Nikkor 17-35 f/2.8 and the 24mm tilt-shift. However it does NOT fit on the Nikkor 28-70mm f/2.8 (yes, *28*-70, not 24-70). The problem with some lenses is that the lens barrel itself prevents the adapter's threads from reaching the len's threads.I still rate highly, it's very well made and fits the wide-angle lens I do have perfectly. I just wish the manufacturer was clearer on which lenses it does fit. Rated 5 out of 5 by ScottConover from Great alternative to expensive options Yeah, I love it. It's just an adapter, but coupled with the Lee Big Stopper, and a 100mm hitech filter holder, it's super nice. Used with a 14mm (21mm ff eqv)for landscape and architecture. No vignetting! Rated 5 out of 5 by Randy's Photos from Works well and Needed Critical for connecting the Formatt Hitech 100mm filter holder to a lens that accepts 77 mm filters. Definitely worth the price! Rated 5 out of 5 by Crash from Adapter ring for HiTech Tryed out both sizes recently with no problems Fits well with the like holder. No issues with the threads. Rated 4 out of 5 by chinsk from Essential for the holder Can't use the holders without the adapter. I put the adapter on the lens staight out of the box and the thread is really tight - to the point of getting stuck. A little drop of lube fixed the problem after that though... Only trouble I have now is providing shade to the lens as you can't use your lens hood with these ND holders. Rated 5 out of 5 by Phil from It works as advertised I placed this guy on my tokina 11-16mm wide angle lens. It fits comfortably. I had to use the shorter screws on the 4x4 holder though, as vignetting was apparent, even though this filter holder offsets the 4x4 closer to the lense to reduce this undesired effect. Rated 5 out of 5 by PNK Photo from Works as Designed... Well made and good fit A precise fit into the Formatt Hitech Filter Holder... No issues with fit on Nikon 10-24 lens ! Rated 5 out of 5 by Lou from A+ i would buy again Allows the holder to be mounted as far back as possible.